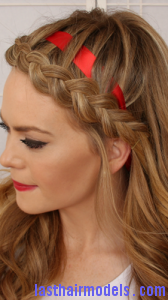 A Dutch lace braid is a very unique from of a traditional braided headband that can give a more distinct effect over the head. 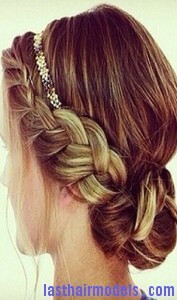 It is important to follow a particular method create this hairstyle on your own. This hairstyle can be created with a straight hair or if you want to do it with a curly or wavy hair, make sure to use the styling hair gel. 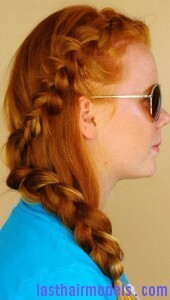 Here are few simple steps that can helpful in creating this hairstyle without getting help from a hairstylist. Start the styling process by parting the hair from ear to ear on top of your head. Then secure back half of your hair with a hair band and try to make a Dutch braid near your left ear by keeping the braid as close to your part line away from the face. Make sure to add hair into your braid from the front to create a lace or feather stranding effect from your forehead into the braid. Continue the braiding process till you reach the other end of the ear. You must continue to create a simple braid down the remaining hair to secure it with an elastic or use two bobby pins by crossing them to secure the remaining hair behind the right ear. Just release the back of your hair from the hair band to make it fall around the face. At last mist the hair with a hairspray to control the flyways.